“There's never enough time to get everything done.” Does that sound familiar? You can't create more hours in the day because everyone is stuck in the usual 24 hours. But, you can get more out of each hour by making your time count. That doesn't mean working 18 hours a day, either. The trick is to plan ahead. Sit down the night before and plan out your activities for the next day. It will let you identify exactly what your priorities are at any given time. You'll be amazed by how much more you can get done if you always know what you should be doing now and what can wait until a little bit later. Prioritizing is a key part of time management. 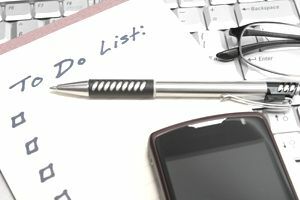 When you first try planning your day, you may have a hard time deciding which items on your to-do list are the most important. Sometimes it seems like everything is crucial. But with practice, it will become easier for you to determine which items are truly critical, which are merely important, and which are optional to complete that day or can be put off to another day. Create a list of everything you want to get done tomorrow. Include everything, not just work-related functions. If you need to take the dog to the vet or drop a package off at the post office, add those tasks to the list as well. Ask yourself, “Which items on this list will have the biggest positive impact on my life if I get them finished tomorrow?” Circle those items and write #1 next to each of them. Pick out your second, third and fourth most critical items and label them accordingly. Now start a new list. Write down exactly what times you intend to spend working on your four highest-priority tasks. You don't have to put them in order or make them your first activities of the day, but you'll be able to ensure that you'll get them done if you make an appointment with yourself to accomplish each of them. Block out a reasonable amount of time for each task. Fill in tomorrow's schedule with the rest of your activities. This schedule doesn't have to be set in stone. You might end up shifting things around as new tasks come up and old ones lose their urgency. Bring your schedule with you and post it someplace where you can easily see it as you work. If you need to make radical changes, you can pencil things out or shift the schedule around. Setting a schedule and sticking to it is only half the battle. You need the energy and drive to tackle that to-do list and to accomplish it to the best of your ability. Good time management begins with a few measures you can take even before you begin setting a daily schedule. Make sure you get enough sleep. According to the Mayo Clinic, a healthy adult who is not pregnant requires from seven to nine hours of sleep per night to be at their best the next day. "No" is not a dirty word. You can turn down requests and demands on your time if saying yes means you won't get other things done. Let's face it: If you have eight must-do items on your list and eight people ask you to do "just this one little thing," something is going to have to give. If you're uncomfortable with saying no, come up with a response you can live with, something like, "I can't possibly get to it today, but I can probably help if you can wait until Thursday." Try an experiment before you create your daily schedule. Keep a log of what you do with your time for a few days or maybe a week. Jot each activity down in your smartphone or whatever else is convenient when you're on the go. You might be surprised at patterns you detect. It can help you identify time-drains that you can eliminate from your life, or at least reduce to manageable time spans.